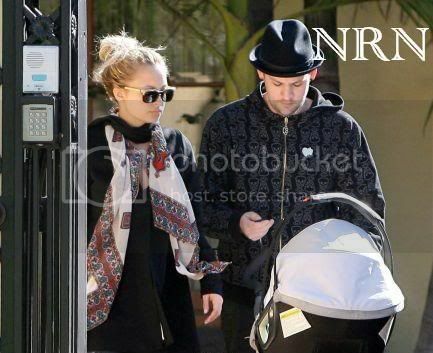 NICOLE RICHIE NEWS: Nicole & Joel go for a stroll + Lots more! Nicole & Joel go for a stroll + Lots more! I finally found out that the brand of sunglasses Nicole is wearing, they look alot like Ray-Bans wayfarer style but don't be decieved they are Chanel. This article is a little old but its a great read. Reality TV star Nicole Richie is set to relaunch her post-pregnancy career by taking to the Broadway stage and starring in hit musical Chicago. Nicole is tipped to follow in the footsteps of Ashlee Simpson, Jennifer Ellison Brooke Shields and Renee Zellweger as the latest big name Roxie Hart in the show. The Los Angeles-based 26-year-old is now considering the possibility of moving to New York with boyfriend Joel Madden and their child Harlow. An insider tells American magazine Us Weekly, "Nicole's definitely interested and is weighing it out."